With an unfortunate sense of timing, Microsoft has released pricing and availability information for its new 'Surface' tablet that was originally announced back in June. The release occurred just hours before Apple sent out invitations to its iPad Mini launch event next week. 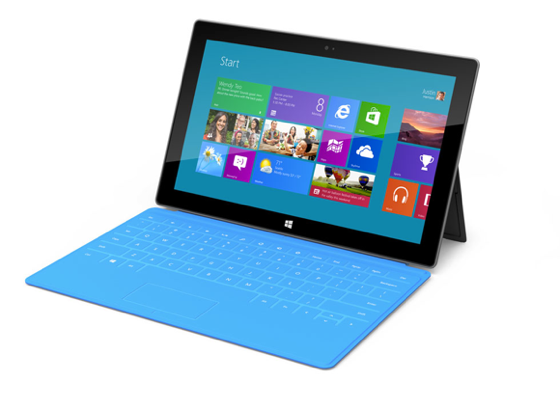 The Surface will begin shipping in the US, UK, Canada, Australia, France, Germany and Hong Kong on Friday, October 26th. The Windows RT-powered Surface starts at $499 for a 32GB model, $100 cheaper than an iPad with comparable storage. The Touch Cover, one of the more interesting innovations in Microsoft's tablet venture, isn't included for that price; it's only available as part of a $599 bundle with the same 32GB tablet. There is also a 64GB model that includes the Touch Cover for $699. Separately, the Touch Cover is $119 and the Type Cover is $129. The Surface is available for preorder from Microsoft's website. So basically, if I switch to or being with a Microsoft Surface, I will be 100% guaranteed to dance my pants off. Thats really the only takeaway I got from that commercial. Wow, Apple sure stole the tablet thunder today. I would have also expected the RT version of the Surface to be more competitively priced. $500 seems like a high cost of entry for an unproven product with a limited app ecosystem. M$ steps on itself once again. Pricing offers no one but the hardest corest M$ fans (are there any left?) a reason to buy. It can't compete with either Android or iOS at this price point. Enterprise already hates Windows 8 and loves iOS. Consumers have long felt trapped by Windows until iOS presented them a post PC option. Anti-Apple folks adopted Android. Who's left to buy Surface? $500 seems like a high cost of entry for an unproven product with a limited app ecosystem. I'm so glad you didn't advise Apple in early 2010. I switched from a PC to an Apple about 9 years ago...being new too OSX I called Apple a couple times, they answered my question and solved my problem hassle free, and every time I've had to deal with Apple customer service I have had no issue. The last PC I owned was an HP, had issue out of the box with windows, called HP, they gave me a number for Microsoft, I called Microsoft they wanted to charge me a fee, called HP and HP said use the restore disk and restore computer. Has Microsoft customer service improved...one of the best thing I like about Apple. Hold up one second........120 BUCKS FOR A FRICKEN TOUCH KEYBOARD THAT UTILIZES SO MANY APPLE PATENTS........WTF!?!?!??!?! EDIT: Replaced "Violates" with "Utilizes" because maybe thats not the best way to put it. What's the point of that commercial, other than to make you "feel" really good about a product they give you virtually no information regarding? No specs, no pricing, no availability, a brief comment about colours and apps on some website. This is advertising today - "buy our product so you'll feel better in life." There's nothing about what it does, what it can do, how it can help/benefit your life, other than to make you happier, which we never require them to prove. Might as well promise superhero powers if you buy their product. This is why I never watch commercial television: the advertisements. They're catchy and fun, but they're so frigging manipulative I prefer to think for myself and decide for myself and make informed decisions not based on whether that woman in the bikini on the motorcycle comes with each purchase, or she'll be what's on offer after purchase in every woman who sees me on that bike. Why not just do away with products entirely, give money to these corporate overlords and each time you pay they give you a drug injection that makes you feel better. At least they'd be honouring their promise they advertise in their commercials.